A group of six miniature animals carved from turquoise matrix, comprising a duck, a pig, three rams, and a one-horned mythical beast, bixie. The animals are realistically carved and each animal is drilled through. The colour of the turquoise stone rangesfrom a light blue to a pale green, mottled with metallic grey colour. The drill holes in these exquisitely carved animals indicate that they were made as beads, perhaps for the type of elaborate pectoral that was popular at thetime. Kneeling sheep in Chinese culture are considered symbols of filial children by Confucians. Two comparable miniature animals, including a ram and a duck made of black amber, were part of a string of beads excavated from a WesternHan dynasty tomb at Yaozhuang, Yangzhou, Jiansu province, and are now in the collection of the Yangzhou Museum. Turquoise has been used in personal ornaments since the Shang period (16th century – c. 1046 BC), and continued to enjoy popularity during the Han dynasty. 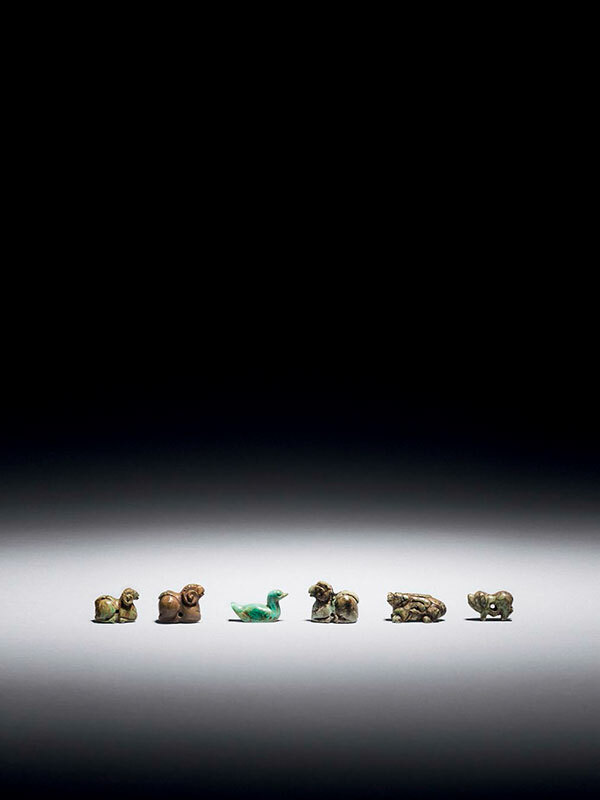 Some turquoise beads in the shape of miniature birds and animals were excavated from Jinning, Yunnan province and are now in the collection of the Yunnan Provincial Museum. Two closely comparable turquoise miniature rams dated to the Han dynasty are in the Kwan collection, Hong Kong. Examples of two rams and a pig, made of agate and dated to the Han dynasty, are in the Liu Family collection. Another example of a mythical beast bixie is in the collection of the Museum of East Asian Art, Bath, where it is dated by McElney and Forsyth to the early Six Dynasties (220 – 420 CE).